This time my 14yo daughter answered the phone. Luckily she was aware of the previous phone call and has already developed a strategy for hanging up on unsolicited callers with Indian voices. This time the caller claimed that there was a virus on our computer that was stopping their computers from operating correctly. And laughed at the proposterous notion. I feel so bad for the people who will inevitably be caught out by these scammers. Now for something more tasty. 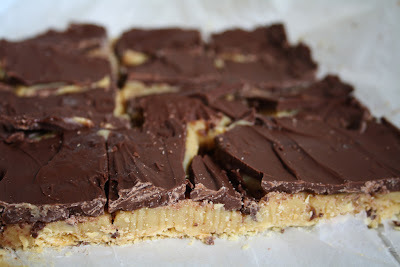 The caramel slice my daughter was making when interrupted by the caller! Caramel slice is my very favourite slice in the world, this looks absolutely delicious.